Martha and Fabián had a list of names from the Causa General starting in the year 1938; of people who had land or money taken from them by the anarchists for the Collective in Càlig. They didn’t know who some of the people were so they went to consult the present day Senyoret who lives on the other side of the village in the family mansion, a beautifully restored five-floor house with a large garden and swimming pool in the back. Martha had interviewed his father, the town historian, in 1991 to learn more history. The son, Juan de la Figuera, has been working on a genealogical database, which now has at least 20,000 names. Martha and Fabián were able to find out about families who had had land collectivized which the Anarchists had neglected to include in their lists. 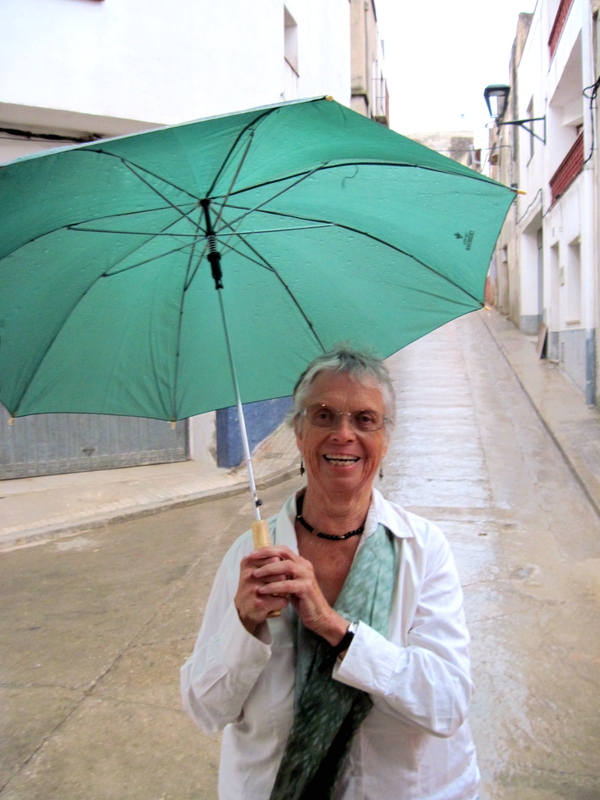 When Fabián and Martha left it was raining and the Senyoret kindly lent Martha a beautiful light green umbrella that was a perfect match for the scarf she happened to be wearing. She did however return the umbrella a few days later stuffing it into the mail slot in the large wooden door.